If you’ve ever visited the Mary Rose, or seen pictures of the interior, you will be aware that it's somewhat dark in the museum. We have lighting where possible, and we hold special Lights-Up mornings to assist those with visual impairment, but for conservation reasons, as well as to avoid causing too many reflections off the large amount of glass we have around the museum, we have to keep the lighting to a minimum. Bearing this in mind, it's unsurprising that some visitors find it difficult to take photos of the Mary Rose and her artefacts. Flash photography is not permitted in the museum for various conservation and safety reasons, so please make sure you know how to turn the flash off. You'd be surprised how many people don't know how to do this, and think they can take photos anyway! Turning off the flash is pretty easy, usually done via a button on the back, featuring a lighting symbol like the one to the right. Turning the flash off will also help you take better photos as if you take a photo of something behind glass with flash on all you will get is reflection. This can help the camera focus in the dim lighting and reduce noise (speckles) on your image. If your device doesn't have this, setting it to auto (or pro auto) will also be fine. When a camera is set up for low light levels, it is prone to blurring. This is because the camera is taking longer to get enough light into it to form a decent image. Therefore, you need to hold it really steady. The best way to do this in the museum is to hold the camera so the lens is touching the glass. This will prevent the camera getting any reflection from the glass plus acts as a tripod and will keep your camera steady. While we don't have a policy against tripods, it can inconvenience other visitors if you have one set up in the galleries. This is obviously a bit difficult in the summer when we all bring out our bright, floral clothing so wear a plain shirt or perhaps bring a plain hoody when you visit. Of course, following the previous advice should make you less visible anyway. Yes the lights on the Mary Rose change colour but if you really want a picture of it in a different light setting just wait. The lights and projections are on a loop so if you miss your chance first time, wait for the sequence to go round again. We all want to get that perfect shot, but don’t forget that other people are visiting the museum too. Try not to take too long in setting up your pictures, and try and get them from places with little footfall; Our “Perfect spot for a photo” signs give you a good guide to places where you get a fantastic view of the ship, without blocking anybody’s way. Getting a #MuseumSelfie with our ship's dog? Rather than standing behind him, position yourself behind the narrow window of the case, looking through the case with the camera (see photo). This allows you to take advantage of the light from his case, otherwise you end up with a great picture of the dog, but you just end up as a shadow! So now you have the best chance of taking incredible pictures in our museum. 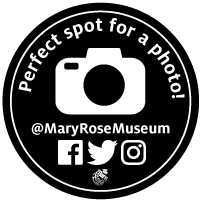 We hope you take some incredible images and don’t forget to share them with us on social media, tagging us at @MaryRoseMuseum!